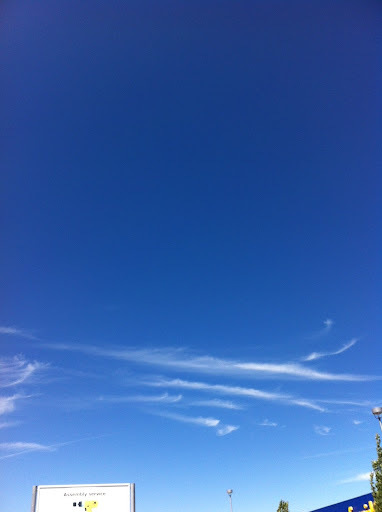 Here’s another of those “new” hooked cirrus clouds, photographed yesterday. Interesting, this one's new to me. I can't say anything with certainty without looking more deeply into his claims, but just on the basis of his testimony I would say Jim McCoy is either delusional or full of it. He lists "voodoo" and "humanism" as religions he has practiced; Vodun practitioners typically don't refer to their religion as "voodoo", and only certain fundamentalist Christians refer to humanism as a religion (on the grounds that it has "scripture", the Humanist Manifesto). Other terms he uses, like "registered witch", are completely meaningless. There isn't some International Witch Registry; Wicca isn't the freaking DMV. And his one world religion conspiracy theory doesn't add to his credibility. Let me further explain myself. There absolutely was the practice of folk magic, and the village shaman, or "cunning folk" was held in high regard in medieval Europe. (They did not practice animal or human sacrifice, either.) Usually they just told fortunes, got rid of warts, used herbal remedies for illnesses, etc. However, there is no evidence whatsoever for an organized witch religion with written scripture and established worship rituals. There is so many historical inaccuracies with most conspiracy theories, and often they are promulgated by fundamentalist Christians. Often it's just an excuse to disparage what they believe is the opposition, in this case pagans and wiccans.